Consumer products and topical medications today contain many allergens that can cause a reaction on the skin known as allergic contact dermatitis. 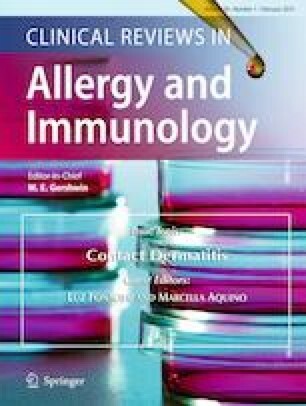 This review looks at various allergens in these products and reports current allergic contact dermatitis incidence and trends in North America, Europe, and Asia. First, medication contact allergy to corticosteroids will be discussed along with its five structural classes (A, B, C, D1, D2) and their steroid test compounds (tixocortol-21-pivalate, triamcinolone acetonide, budesonide, clobetasol-17-propionate, hydrocortisone-17-butyrate). Cross-reactivities between the steroid classes will also be examined. Next, estrogen and testosterone transdermal therapeutic systems, local anesthetic (benzocaine, lidocaine, pramoxine, dyclonine) antihistamines (piperazine, ethanolamine, propylamine, phenothiazine, piperidine, and pyrrolidine), topical antibiotics (neomycin, spectinomycin, bacitracin, mupirocin), and sunscreen are evaluated for their potential to cause contact dermatitis and cross-reactivities. Finally, we examine the ingredients in the excipients of these products, such as the formaldehyde releasers (quaternium-15, 2-bromo-2-nitropropane-1,3 diol, diazolidinyl urea, imidazolidinyl urea, DMDM hydantoin), the non-formaldehyde releasers (isothiazolinones, parabens, methyldibromo glutaronitrile, iodopropynyl butylcarbamate, and thimerosal), fragrance mixes, and Myroxylon pereirae (Balsam of Peru) for contact allergy incidence and prevalence. Furthermore, strategies, recommendations, and two online tools (SkinSAFE and the Contact Allergen Management Program) on how to avoid these allergens in commercial skin care products will be discussed at the end. Literature review. No research performed.